A deep, warm tawny color. She's got a full fruit nose: grapes, cherries, plums, apples, and lemons. She's smooth and creamy in the mouth, with more fruit and a kick of spice. Afterwards, I'm left with some serious cinnamon and nutmeg, and a nice warm feeling in the cockles of my heart. That's right -- in the cockles. Not quite as light and soothing as her sister, the 16yo is nevertheless a joy to drink. This is a deeply satisfying malt, and an excellent digestif. And now, I shall drop the metaphor of these Aberlour whiskies to women, as it's beginning to sound creepy. After all, they're only teenagers! And, strangely, there don't seem to be any good pictures of this dram online, which is why you're getting one taken by me of my own bottle. 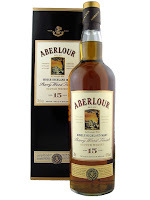 Plus, Aberlour's website doesn't mention it. Is it out of production...? That would be a shame. I'm really not as big into bourbon as I am into Scotch. It's a very different flavor, though it's not a bad one. It's also tricky for me to taste, since it's the main ingredient of my favorite cocktail back when I was in college, the Manhattan; I have to work to keep myself from writing simply, "This tastes like a Manhattan." It must be made from a grain mixture that is at least 51% corn, and is typically closer to 70% corn. It must be 100% natural; no caramel coloring allowed! The barrels in which it is aged must be new, American charred oak barrels. Bourbon aged for two years or longer may be labeled as "straight" bourbon. Bourbon younger than four years old must be labeled with its age. So, you see, it's not just Scotch made in America! 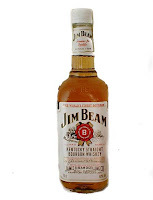 Anyway, courtesy of my very silly sister, I bring you that perennial classic -- and the first American whiskey on this blog -- Jim Beam, a.k.a. Jim Beam White Label. The usual russet color of whiskey. It's sweet on the nose, with vanilla and caramel, and a hint of freshly-ground black pepper. Much softer than Scotch. Do I smell cherries, or is that the Manhattan rearing its lovely head once again? It's thin and watery on the palate, which feels odd to a mouth accustomed to usually creamier Scotch. I'm getting a lot of nutmeg in the flavor here. The finish is long, much longer than I expect, with a lot of butterscotch and a tiny bit of peppermint. As an aside, I happened upon the opportunity to try a glass of Johnnie Walker Gold Label in an Irish pub the other night. I wasn't super-impressed with it, in general, but I'm glad I tried it. I was struck, in particular, with how smoky it was, and it was then that I realized that the reason I'm not as fond as many of Johnnie Walker is because it likely has a higher Islay whisky content than the blends I do like. I don't know this for a fact, but that's what my nose and tongue are telling me, now that they've been educated by the Bunnahabhain 12 yo. Interesting. Ah, the Grouse. When I first tried this one, the only blended Scotches I'd had were the Johnnie Walker Black Label (meh) and the Pig's Nose (wheeeee!). The Famous Grouse was the turning point; the day I tried it, I realized that I do, in fact, love blended whisky. Some blended whiskies, anyway. it's cheap. Around $20 for a 750 mL bottle, and $30 for a 1.75 L bottle. These two factors make the Grouse one of the best bangs for your buck out there. I still can't believe such an inexpensive whisky can taste so damn good. This blend is the lovely burnished color so many Scotches seem to share. The sweetness in the nose hits me immediately. Soft and fruity, pears and honeydew. On this tasting, the alcohol is more apparent in the scent than usual. The texture is nice and creamy, coating the tongue beautifully. The finish is unremarkable, though it leaves me wanting more -- always a good quality! 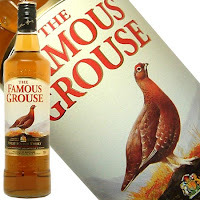 The Famous Grouse has something about it that makes it undeniably drinkable. It's the kind of whisky you could just sit and drink all night long, and never get tired of it. It's earned a permanent spot on my drink cart, and I'm just so glad I ventured out of my comfort zone to try it! This, dear friends, is the Scotch that started it all. I received a bottle of it from a friend for Christmas in 2006. When I tried it, I was struck for the first time by how different one Scotch could be from another. 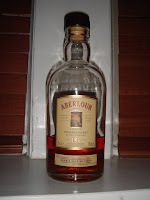 This Aberlour was noticeably sweeter than the Glenlivet 12 I was used to, and a fair sight darker in color as well. From that moment forward, I became a true Scotch fan. This is one of my favorite drams, so much so that I couldn't bear to finish the bottle. I've made it last until today, because I love it so, and because I can't find the blasted thing in any liquor store I visit anymore. I used to see it every now and then at Sam's Wine, but no longer. They don't even have a spot for it on the shelf now. But I found a store online that still had a couple bottles in stock, so I ordered one, ridiculous shipping charges and all. Can't complain though -- it's so worth it. And now, I get to finally polish off this bottle of liquid joy. Beautiful tawny color. Sweet and fruity -- melon and bubblegum, with a trace of mint. Delicious and comforting. Soft, delicate, proud, and mellow. Seriously, I'm in love. I want to marry this whisky. I want her to take my name and bear my children -- sweet, sherry-finished children. I know how our President feels about homosexuals, but what about whiskysexuals? So, on the Christmas list I gave my folks last month, I included "some interesting new whiskeys to try." I didn't really know if they'd go for it, but I figured, what the heck. I was also a little desperate for things to ask for. Lousy Christmas lists. Anyway, December 25th finally rolled around, and my sister brought out a gift bag for me. I looked inside while she grinned evilly, and found a small bottle of Jim Beam bourbon. Now, my sister loves giving horribly disappointing gag gifts before bringing out the real stuff, so I wasn't worried; I figured there was more to come. And there was. My dad and she picked out for me this lovely bottle of Macallan. I've tried a number of their scotches before, but never the 10 yo Fine Oak expression. Before even tasting it, I knew it was a great gift. I've never met a Macallan I didn't like, and it was new to me. So, thanks, Dad and Sis! A deep copper color. The nose explodes with orange, especially with a bit of water; a hint of molasses and gentle floral notes hide beneath the citrus, sweet and sour at the same time. A very soft, creamy texture -- really nice mouth feel. Maybe not the most complex whiskey around, but a very satisfying one. A pleasure to imbibe! Nice job, family!